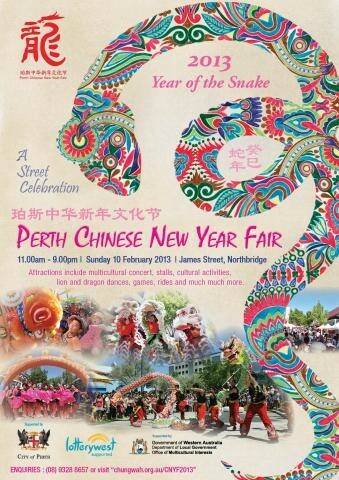 Following the success of last year's celebrations, the Perth Chinese New Year Fair is back to usher in the Year of the Snake. The New Year Fair will see James Street come alive with food and market stalls, lion and dragon dance performances, street performances, and cultural activities. Lake Street will be a family favourite as the street is transformed into a fun zone of water themed rides and games. A multicultural concert will be staged at 7.00pm at the Northbridge Piazza, presenting vibrant and colourful performances by various groups from around Perth. James Street and Lake Street will be closed from 6.00pm Saturday 9 February until 4.00am Monday 11 February 2013 for the celebrations.